In 1785 the Lapérouse expedition departs from France, the mission of its two frigates to circumnavigate the globe for the glory of science, exploration and France. Aboard each vessel are men drawn from the most admirable walks of life, each intended to exalt France’s great contribution to the Enlightenment, including engineers and navigators, scientists and doctors, artists and chefs. They are led by aristocrats, if not by birth then by decree. The recent unfortunate demise of Captain Cook and the unseemly fate of the Bounty might cause the officers and crew to pause for a moment but there are none aboard who doubt the expedition’s success, all confident of the welcome they shall receive wherever they find harbour. And so begins an extraordinary voyage which will carry approximately two hundred men so far from their homeland, taking them to the islands, towns and wastelands of Africa, South America, the Arctic, Australia and Asia. There are so many wonders to see and record, so many adventures to be had, and yet no-one aboard the two vessels could possibly have expected the sea to show such fury or remote populations to exhibit such knowing suspicion. Perhaps even more extraordinary, they might not have suspected that so many of them would have discovered in themselves such a capacity for love, knowledge and beauty. 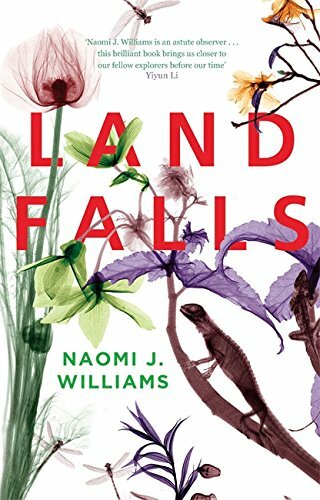 Landfalls is a fabulous novel, quite literally, in so many ways. Most immediately striking is its gorgeous cover, without doubt my favourite of the year and even more glorious in the flesh. Each chapter is told by a different crew member and, while these reports together form a perfectly cohesive and rich portrait of the expedition and its men – with the same characters appearing throughout, painted by different eyes, they each present a fresh perspective on the same events, providing such a varied range of insights into the expedition’s goals and failings. The voices are wonderfully drawn, a cross-section of the ship’s officers and crew, each with their secret aspirations and fears, sometimes almost wilfully blind, some likeable, others less so, and many thinking of the families left so far behind. There are stories here that capture the excitement of the unknown while there are others that harshly remind us all of the dangers. As the novel proceeds and the months and miles pass, it is these dangers that take precedent. But for a time we’re allowed to enjoy the expectation of outwitting the English, charming a beautiful girl in port, discovering an unknown plant or animal, tasting for the first time something fantastically exotic and delicious. Some stories are surprising and almost incidental, especially the journey of de Lesseps across a frozen Russia, and it is these that are perhaps the most memorable and powerful. Naomi J. Williams digs deep into the hearts and minds of these men of the Enlightenment and often she uncovers wonders. The men aren’t the only characters in this novel, another is France itself. France is on a voyage towards revolution and republicanism. Many of the officers and crew, even the expedition itself, seems out of date and out of touch almost before it begins, and there’s a poignancy as we watch these men think about home, their aristocratic patrons and financiers, little knowing that the world they have left behind is about to disappear – in blood – and will become as mysterious as the one they encounter at sea. Landfalls is a beautifully written novel, its prose reflecting the glory of its cover. The characters are sensitively drawn, the intellectual and scientific curiosity of the time so brightly painted. This novel perfectly captures the spirit of the age as well as its great uncertainty as Enlightenment gives way to Revolution. Along with the curiosity and excitement, there is also tragedy, sadness and love. The men of the Lapérouse expedition paid an enormous toll in the name of science and exploration and Naomi J. Williams lays it bare, removing the veneer and showing us the truth beneath. Landfalls is thoroughly engrossing and totally fascinating. I only wish it were longer. This entry was posted in Historical Fiction, Review and tagged Georgian, Historical fiction on October 21, 2015 by Kate (For Winter Nights).